I grumbled as I had no internet in the middle of the sea. To steal wifi, we needed to be near the coastline. In the old days, pirates stole booty and booze. Now here I am, tryin' to grab some wifi. Suddenly I spotted a small ship moving in the same direction as us, huzzah haha. Captain of the Small ship : Gosh honey, why do you think that big ship is following us? Small Ship's Captain's Wife : No idea honey... Love, my internet suddenly became slow. With the internet back up, I found a map in me inbox. Sure beats maps inside beat up empty bottles. The mark on the map read "Brewbot". It was time to chart a new course. 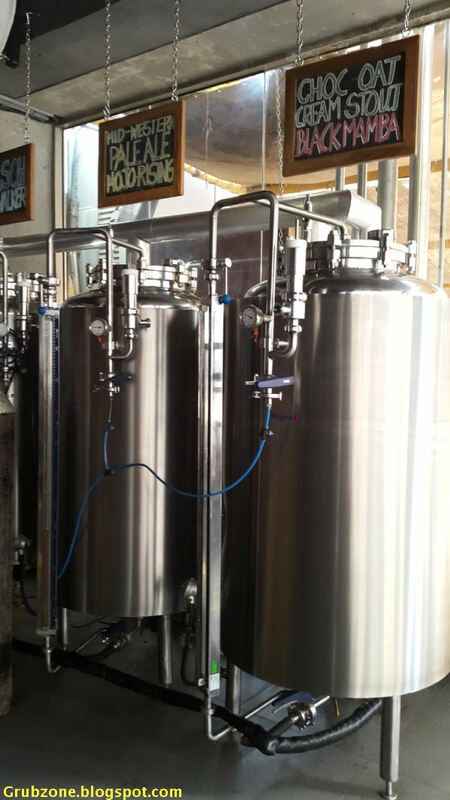 Something is brewing in Brewbot and it better be beer. Brewbot is one of Mumbai's few Microbreweries. They have their own unique brews which makes it a fun place to travel to. Especially for a beer lover. 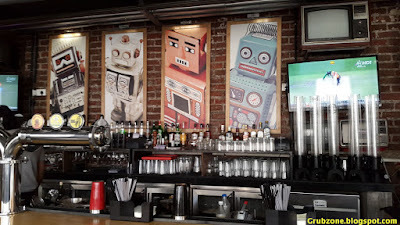 Each of those 70's Box Robots represent one of the four unique beers made here. The Skywalker(Bot looks like Lego Darth Vader gone android), Floating head, Mojo Rising and Black Mamba(Vodoo bot). The place feels much like a tavern but the grub was good and perhaps far better than most main stream restaurants. The reader is warned, I am not much of a beer lover being more of a Rummy pirate or a Vodka guzzler. From Left to Right, The Black mamba is a bitter sweet brew whose additives make it feel less stronger than it actually is. Then comes the mid western pale ale(Mojo Rising) with its strong flavor. Then the Kolsch Skywalker which felt closest to traditional German beer. And finally my drink, the Hefeweizen Floating head. This wheat beer had a banana like tang to it. I sampled each brew and finally settled for the Floating head. 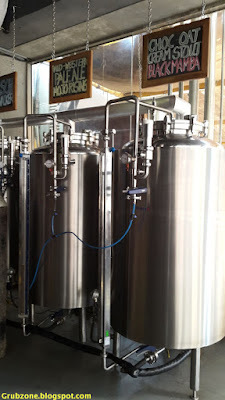 It was potent and I felt that Brewbot's personal touches were most perceptible on this one. But a beer lover can order a quad shot platter of all four. After all, you can't choose yer grog without tasting everything first. Captain : These look so colorful. Like half a rainbow. Crewmate : So which one do you want, Cappy? Captain : Just one shot for ol' me? Hahahahaha,(serious face) Surely you must be jesting lad. 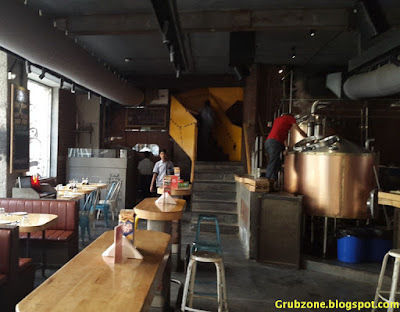 I sampled a lot of Brewbot's grub and I am of the view that it beats most pubs on the wining and dining part. 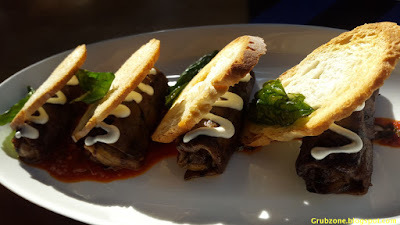 Eggplant Involtini - These rolled up parcels of Aubergine and Zucchini were quite sumptuous. It was an excellent vegetarian take on the classic Italian meat delicacy. The aubergine was probably used sparingly since I did not get my dreaded anti aubergine sensations upon eating this one. The marinara in the bottom added flavor depth, though it could have been spread more uniformly across the dish. Bacon wrapped prawns are a fusion of two things that I absolutely adore. This dish does full justice to both meats without killing the flavor of any. 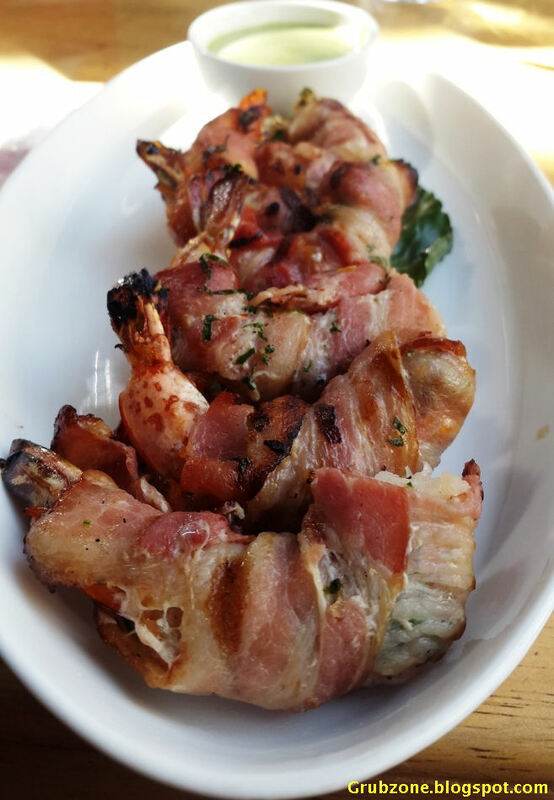 Soft and juicy bacon strips are wrapped around prawns like a Knight wearing his armor. The bacon tasted perfect with its flavor palate of saltiness, savory and a tad bit of sweetness all of which harmonized well with the Prawn's umame like flavor. This dish had a lot of culinary depth and I'd say that it was the entree of the day. Captain : This is so good, its like having Vodka while having Rum. Crewmate : Won't that become a cocktail then? Captain : Aye, this be like a cocktail of food. Tasty Tasty cocktail. House Special BBQ Pulled Pork sliders were a delectable trio of three buns. The meat dominated the flavor thankfully. I cannot tell how many times I have found the bread dominating the flavor in measly packed sliders. Strangely, the flavor somehow resembled North Indian home cooked meats with a high level of saltiness. I had expected the pork to have a bit of BBQ sauce or be caramelized. 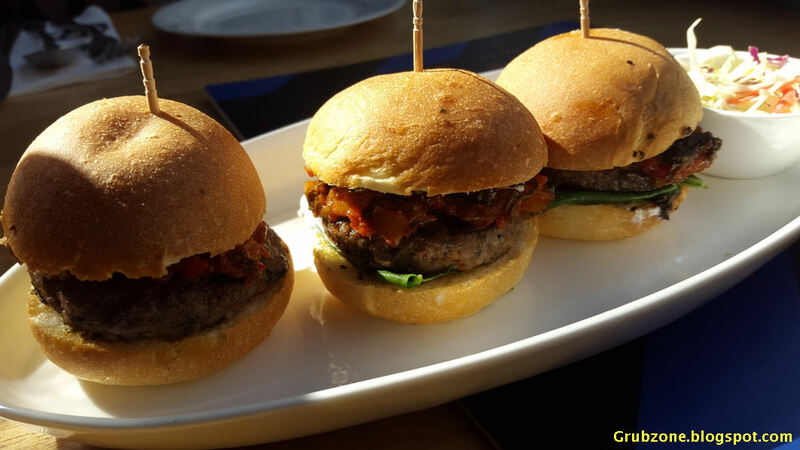 Lamb sliders were a bit of a disappointment. The burger felt dry and the cooking felt uninspired. Perhaps getting rid of the Arugula and substituting caponata with either stock or BBQ sauce would greatly improve the flavor. House Special Calamari wasn't the best squid that I have had. But it was quite a unique twist to the original. I am used to having my calamari coated with batter and deep fried. 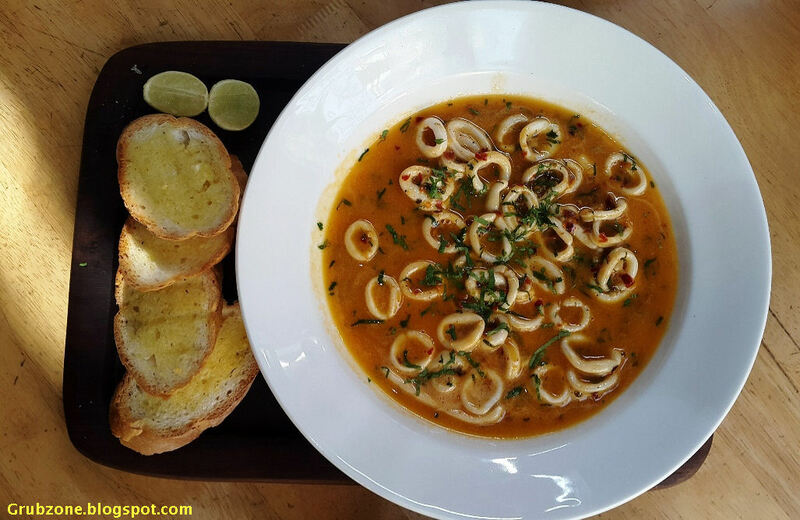 Brewbot's version had calamari rings floating in a soup made out of white wine, lemon juice, garlic, shallots and tomato. The soft chewy rings went great with the earthy soup. Goat Cheese Lollibots err lollipops were simple goat cheese balls sprayed with corn flakes and herbs. This felt more like a side. Other than being a visual novelty, I did not particularly find this as an interesting appetizer. Time to move on to the mains. Poutine - For an item so easy to make and so common in North America, it comes off as a major surprise why poutine is still a rare to come across treat in India. Brewbot's variant was amazingly good. 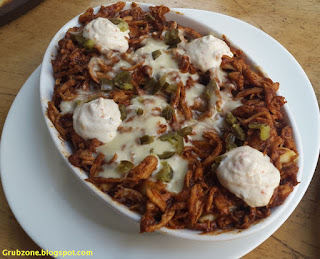 The flavor of the chicken had completely rubbed onto the soft fries. The cheese curds completed the alchemy. The dish felt greasy yet so tasty. It makes an ideal choice for the main slot in a multiple course meal. Captain : I am putting this poutine in me ship's menu. Crewmate : That's a cheesy wordplay. Captain : Cheesy curdy wordplay. Farmhouse Pizza was the better of the two pies served to me. That is saying a lot since the other one contained meat. 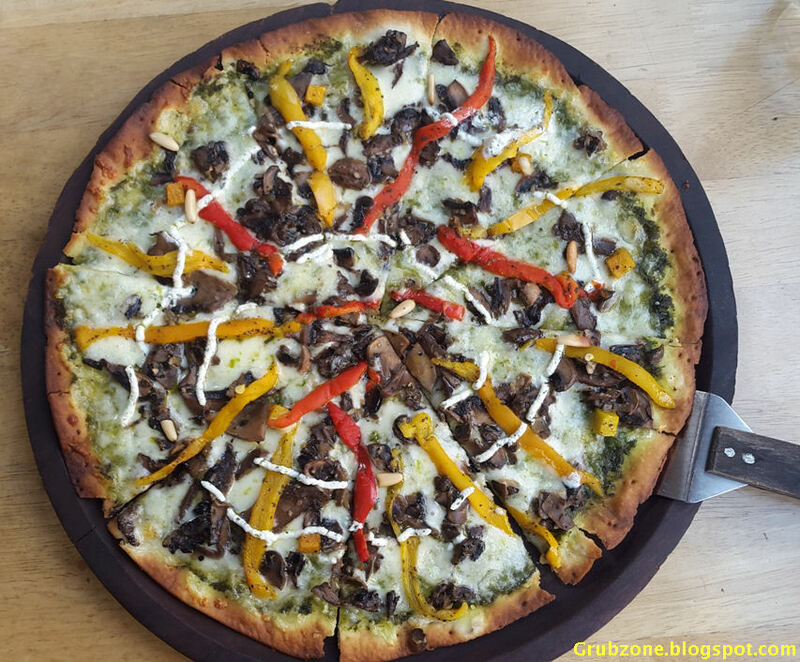 This had a pesto base with pumpkin, bell peppers, mushrooms, Ricotta and pine nuts. The pie was both visibly alluring and pleasant tasting. Pesto dominated the aroma and flavor of the pizza. It also felt light due to the thin base and healthy ingredients. Rejoice vegetarians. Quad Cheese and Bacon pizza. Bacon was a add on, so this was mostly a cheese pizza. 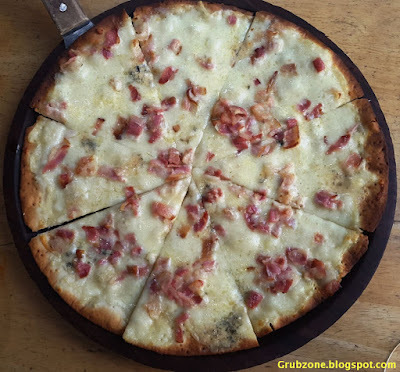 It was said to contain Mozzarella, Gorgonzola, cheddar and probably ricotta. The flavor however felt a bit off. Though I was told that it may be due to the Gorgonzola, I am positive that it wasn't that since I have had the cheese before without problems. I think this could be blamed on the cheesy overdose. Something clashed somewhere. Bacon hardly felt as a participant despite its generous presence. Its flavor completely drowned in the sea of cheese. Chicken Roulade was like a star batsman who went out for a duck. The chicken felt too tough and insipid. The flavor had not sunk well into it. The house stuffing tilted the flavor favor towards the greens. This probably contributed to the chicken tasting bland. The stuffed greens should have been at most a third of what was present. Brewbot had a nice selection of desserts. I am going to use the ascending order in case of desserts. Best dessert comes last. 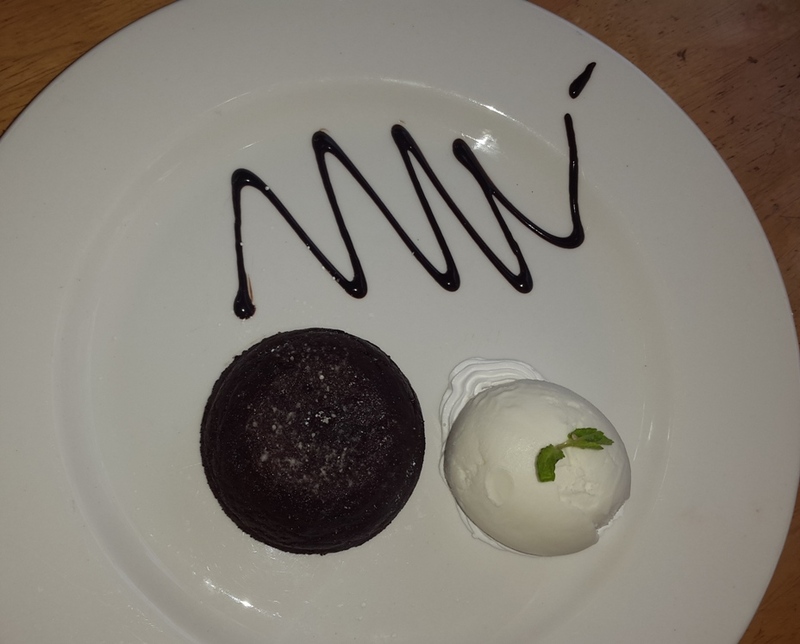 Chocolate Fondant looked perfect on visuals but felt very average. 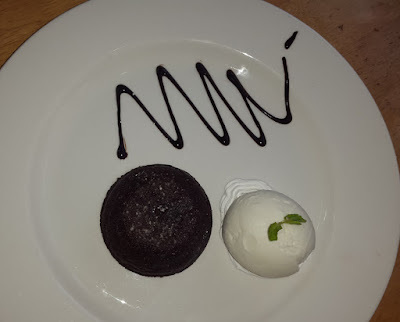 It seemed to mimic choco lava cakes more than fondants. 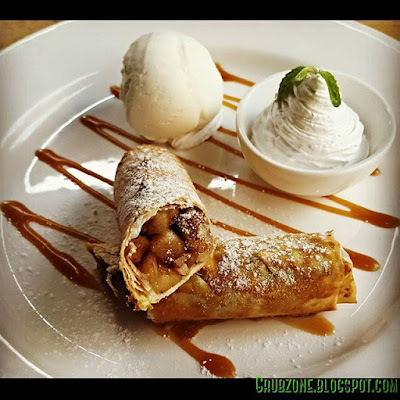 Apple Strudel was a good emulation of the popular Viennese pastry. The filling was soft, tangy and had an aroma of the freshest apples. Dusted with sweet spices and a drizzle of caramel, this can easily be a table favorite. House Special Cheese Cake. The House Special names were getting old at this point but that still does not stop this cheesecake from being awesome. 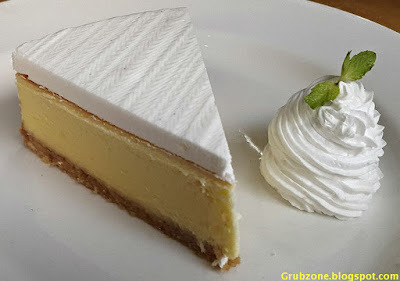 Creamy, soft and tangy (due to lemon essence)- this reminded me of Starbucks discontinued Lemon jazz cheesecakes. Well its Starbuck's loss, I enjoyed Brewbot's variant a lot. 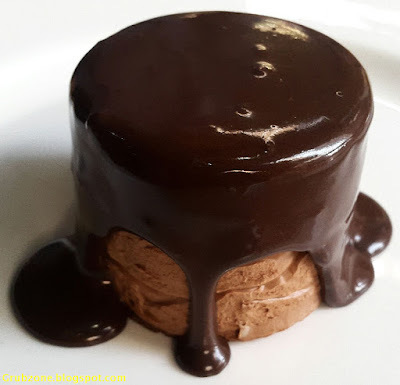 Chocolate and Peanut butter parfait was the best of the sweet lot. It looked brilliant, had an amazing flavor and it left me wanting for more. Too bad, the local patisserie doesn't sell these. The top jacket was made of rich chocolate while the parfait was made of peanut butter and had crunchy elements and crisps embedded into it. Sweet and salty(due to peanut butter) would be the best way to describe it. 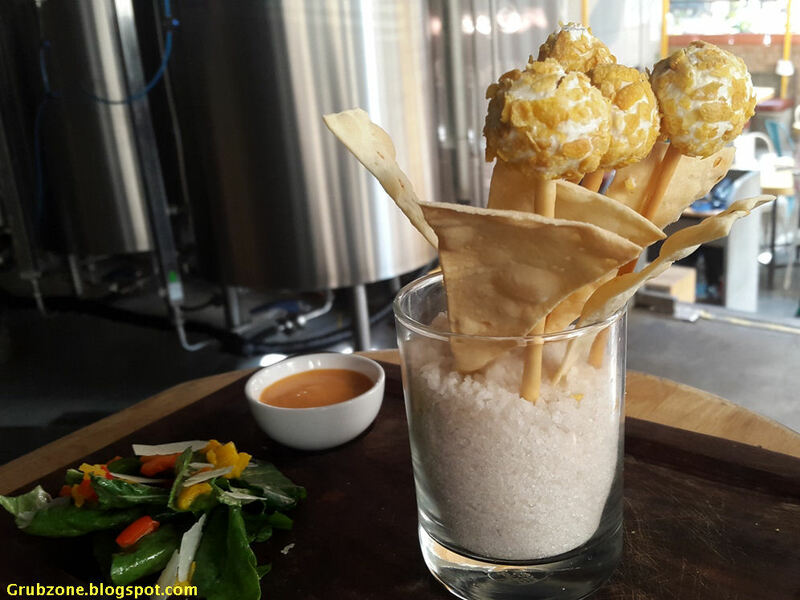 If one is grubbing out at Brewbot then this is not to be missed. Crewmate : Looks like the Captain tripped on the fishing lines again. Captain : These are the voyages of the Seaship Grubzone. Its eternal mission: to explore strange new worlds, to seek out new food and new cuisines. To boldly eat where no human has ever eaten before. Crewmate : That was a peg legged line. The service mimicked that at any decent pub. Though this particular event was part of a blogger/influencer thing and one of the owners himself was assisting the servers so it would be difficult for me to comment thoroughly on the service. The pricing leans towards the upper side. Its higher than pubs like BBC etc but lesser than fine dines. 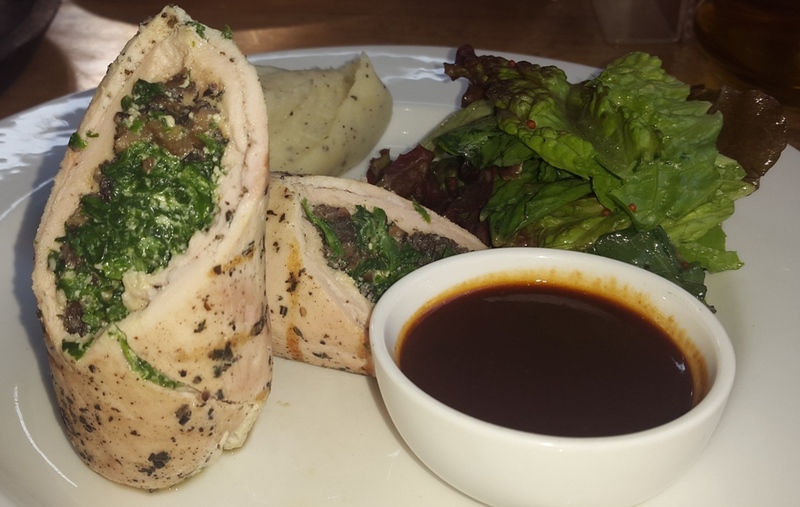 The food mostly is worth it but it could do a lot better with a little lesser. Brewbot is definitely a celebrity among the likes of other famous bots like C3PO and R2D2. (BB 8 was a piece of junk though) This pub certainly outclasses a lot of establishments in the popular Lokhandwala food district. Floating Head Beer, Bacon wrapped Prawns, Poutine and the Parfait should make the perfect course meal for anyone. "Grog Check. Grub Check. Wifi...uhh skip that. All right lads, we have a long day on the sea. Until next time."